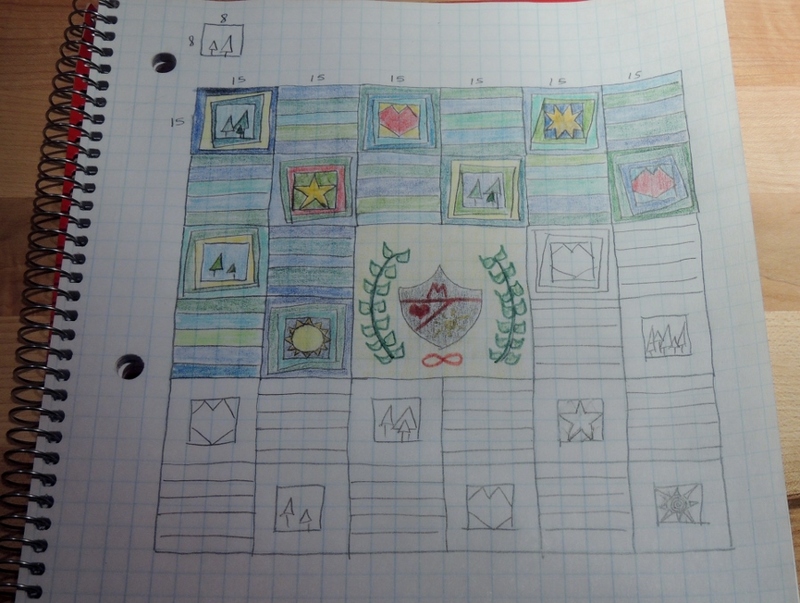 I was contacted by 3 sisters a little over a year ago about the prospect of making a custom, queen sized quilt for their parents based on a photograph of an old family flag that they had created together. I quickly sketched up several concepts, and the winning idea was a more modern take on the elements of the original flag without screaming “flag”! 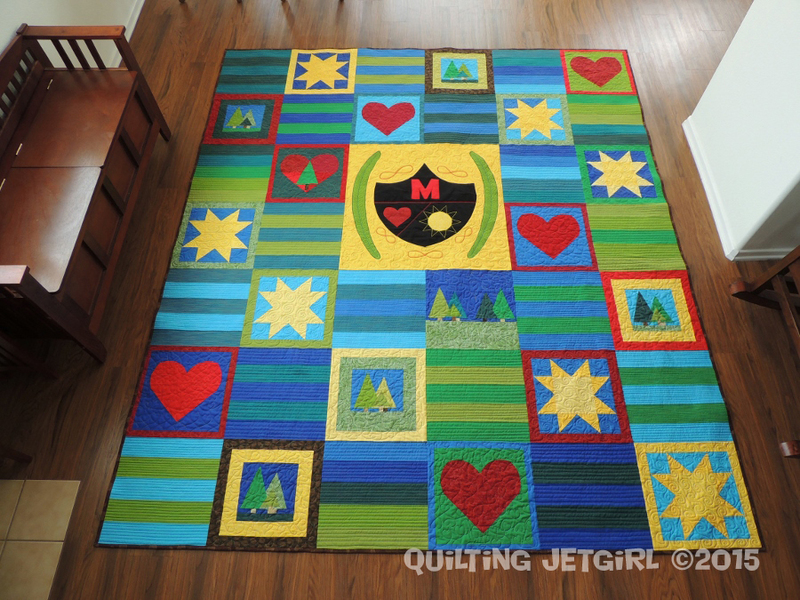 Blocks of colored stripes interspersed with trees, hearts, suns, all surrounding the family crest in the center. I started with the stripe blocks. 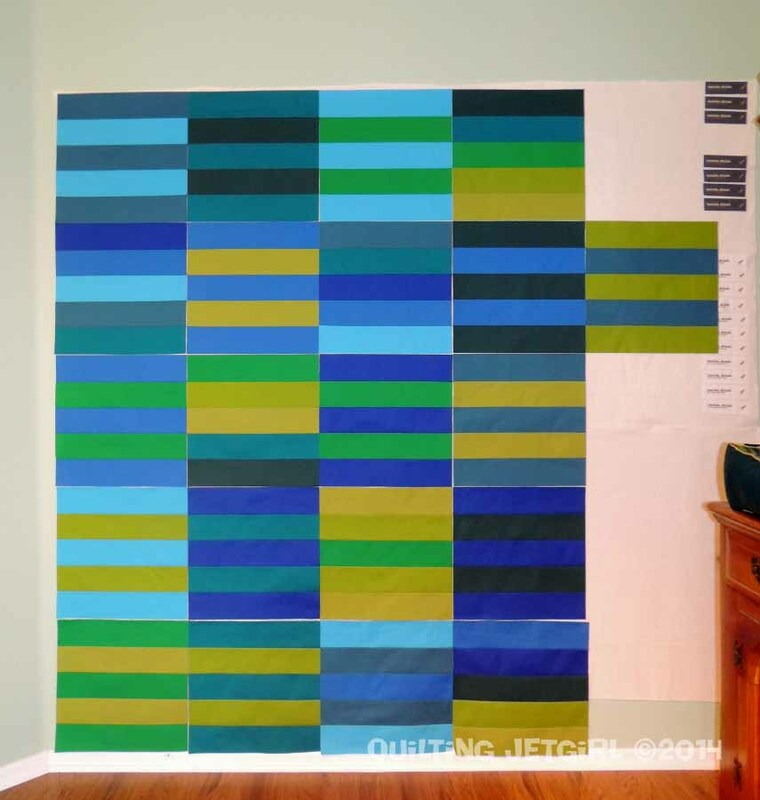 I mixed up the use of the blues and greens to make the stripes more interesting and less harsh for the final quilt assembly. 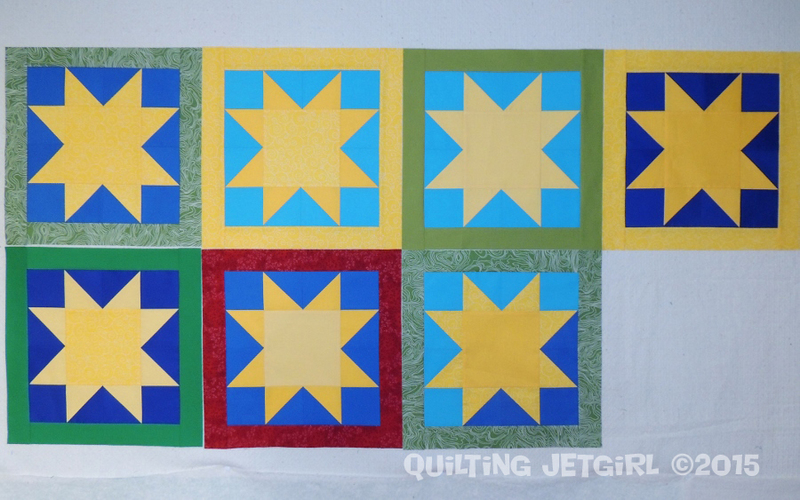 I needed 19 blocks but made 21 knowing that having a few extra on hand when laying out the quilt top would be beneficial. The sisters definitely wanted 5 round top heart blocks for the quilt – one to represent each family member. We agreed to add in one additional heart block with a tree to represent the growing family (husbands, children, etc.). 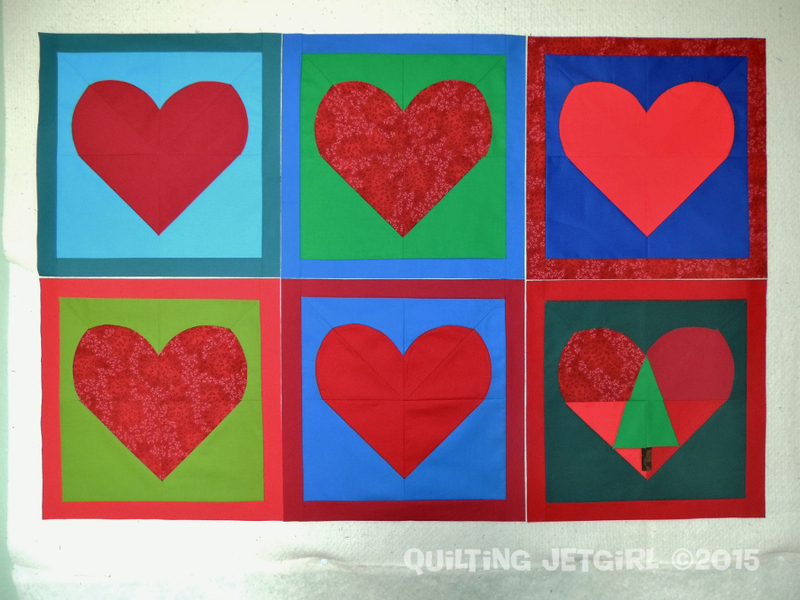 I found and used the Sweetheart Quilt Block tutorial on Sew Mama Sew by Lindsey Rhoses of LRstitched. The block perfectly met the needs of this quilt. I also had several discussions back and forth with the sisters about the appearance of the sun block. They were very clear that they were not looking for different versions or anything that was too “star” like. We settled on the variable star block, which I constructed using HSTs (and not flying geese). 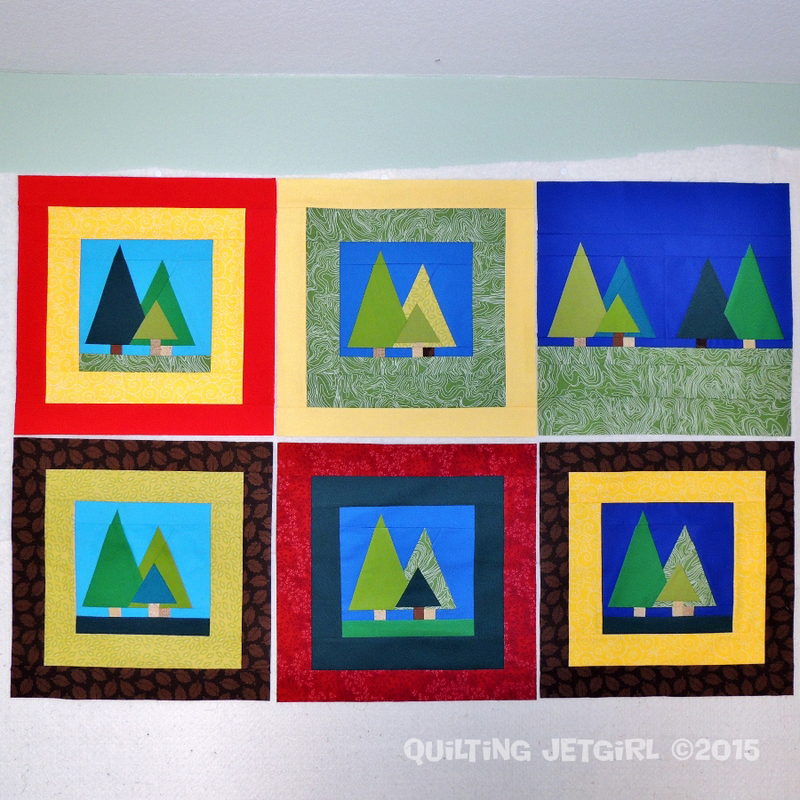 For the tree blocks, I found a paper pieced pattern on Craftsy called the “Pine Tree Park Paper Pieced Pattern”, but that pattern is no longer available on Craftsy, so I cannot point you to the pattern. Again, 5 tree blocks were requested with a 6th block to have 5 trees in it. As you can see, I made good use of the Terrain print and used up every last scrap when I was piecing these blocks! The trickiest part of the whole quilt turned out to be the shield in the center. I originally envisioned using thread painting to get the central elements to show up, but the sisters did not think it was bold enough. I had a bit of seam ripping to do at that point, and I was able to use raw edge applique instead. 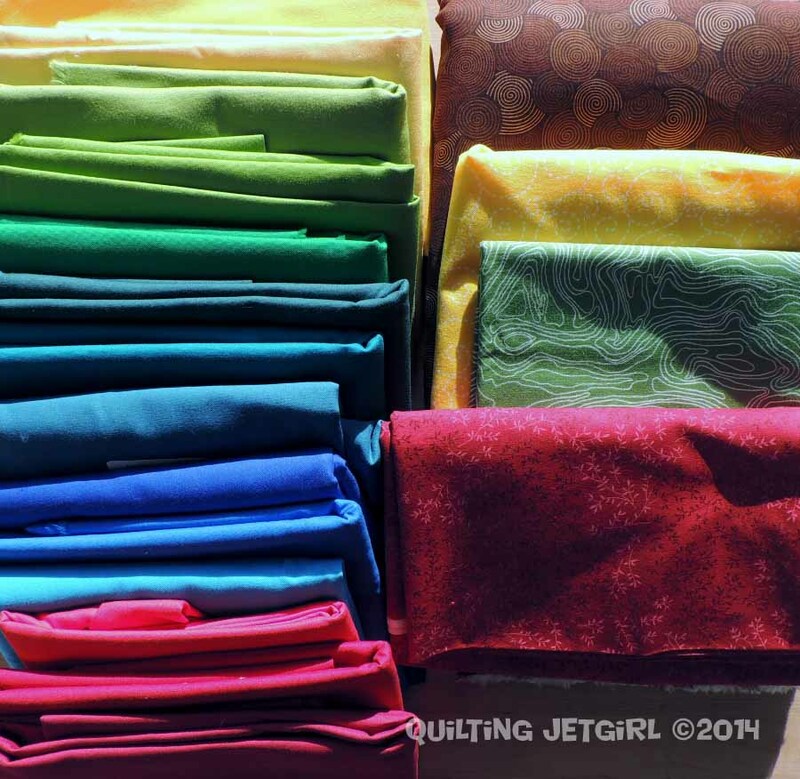 Due to the bright colors in the quilt, the majority of the quilt was quilted using 50wt Aurifil #3817 “Marrakesh” which is a bright variegated thread with primary colors. Locally I did use other 50wt Mettler thread that I had on hand for the green, red, and yellow detail on the center shield. In the stripe blocks I quilted horizontal lines. Over the suns I quilted swirls, over the tree blocks I quilted a meandering vine, and in the heart blocks I quilted a meandering heart pattern. I am so impressed with the creativity and vision of these 3 sisters, and it was a pleasure making something special for them to gift to their parents. Linking up to Finish it Up Friday, TGIFF, and Can I Get a Whoop Whoop. I know they are thrilled! 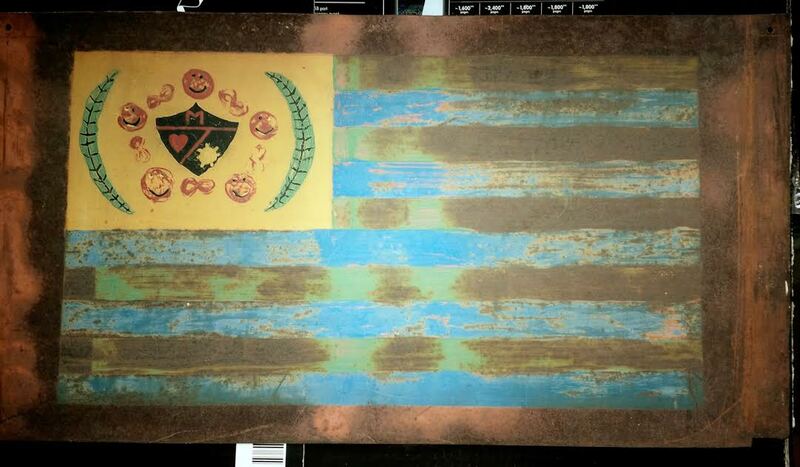 Excellent interpretation of the flag! What an incredible project! I wouldn’t imagine that these commissions come along too often. With the inclusion of the family flag, it must have been a touching moment when the three sisters presented this quilt to their parents. A beautiful job Yvonne. S T U N N I N G ! ! ! W O W ! ! ! That quilt really is breathtaking! I bet the family was blown away! You do great work! W O W ! What an amazing quilt Yvonne – you obviously worked really hard to create something that others had envisaged – not an easy thing to do. 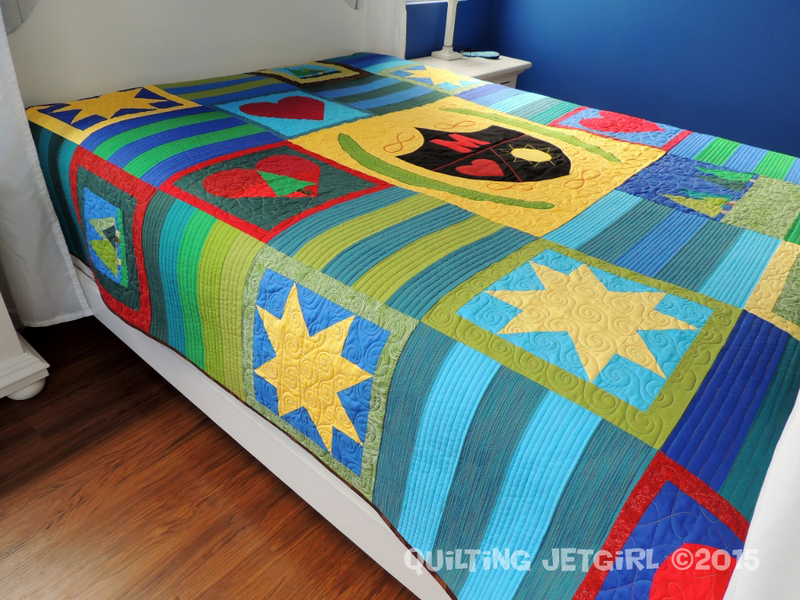 Wow that is a very cool custom quilt! You did a wonderful job interpreting their ideas into this family heirloom! WOW Yvonne! You sure did justice to that whole idea! It looks so stunning on the bed too. I love all the thought and symbolism poured into this quilt! My favorite part is the way you added in the paper pieced pines. It’s fun how seeing it on the bed gives me a whole different idea of the scale of this piece. Great job! Wow, Yvonne. This will definitely become a family heirloom. So much detail! My favorite part is the stars with just a little bit of a different color! Well done Yvonne! Love it! Great to finally get to see it – congrats on a brilliant finish. Love your sketch and the design concept! That is just fantastic, great job! Honey! This is breathtaking!! The colors make me so happy and I just love your interpretation of their ideas!! Well done! I absolutely love the quilting on this! I love what you did with the stripes here!!!! I might need to borrow that idea to finish off my Farmer’s Wife quilt. 😀 It might be just the push I need to finally finish that sucker! I love the different textures in the quilting too. Really, really great job!!! This is such a lovely quilt. That family is very lucky to have found someone that could preserve something so special to them. 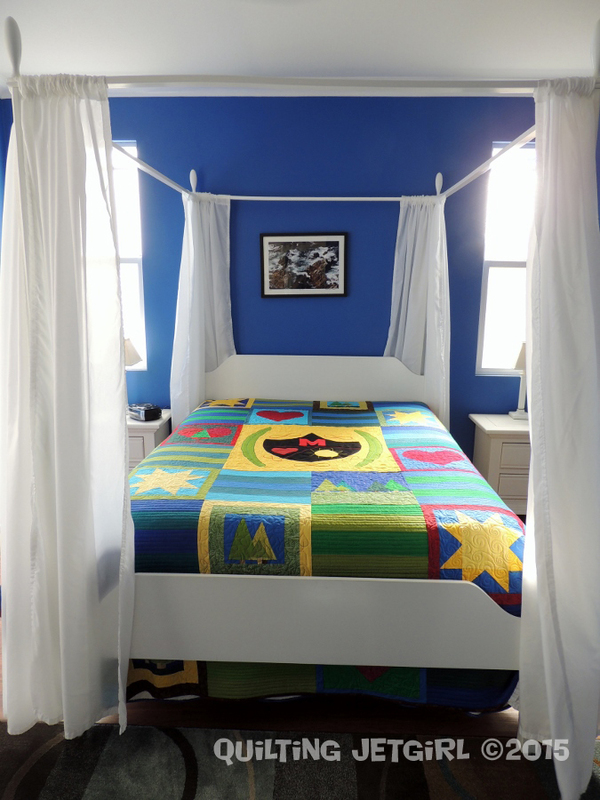 Ooohh, that beautiful quilt on the white poster bed with the blue walls! Woweeeee! Love Love Love your quilt! The colors look so good together. I just love when quilts have a story behind them: why or where they were made or who was the inspiration. I’m sure it will be much loved. Wow, it sounds like this was a complex process, and I’m in awe of your collaboration skills. The quilt looks beautiful on your bed. I really like the oversized blocks and the symbolism behind them. Wouldn’t it have been fun to see the looks on those parents’ faces when they opened their gift?! I really like the quilt! It looks beautiful on the bed adding such a warmth. You did a fantastic job in creating your blocks and in the quilting choices. Thanks for sharing. Great quilt. You are very good at creating strong, graphic designs and this is no exception. I too like the photo on the bed. What a lovely quilt you all came up with! I know the family will love this for generations to come. Thank you for sharing so much about the process. It was a very interesting read. What a fun project this must have been! I love all the different elements and the meaning behind them. Great work!! Such an amazing collaboration! You must feel very proud of this one! I love how every element is so well-thought out to have meaning for past, present and future. Beautiful job executing their design ideas. Great post! That is such a beautiful quilt. A true heirloom. I love the quilting especially. I’m sure they’ll love it. You put so much detail in the quilts you design. I think you’ve definitely found your niche – collaborating with others and designing is definitely your strong suit! This quilt is wonderful, you really took their requirements and transformed them into such a great quilt and family treasure. What a wonderful present idea they came up with, and a wonderful interpretation too. Love those colours and all the thought behind the details, it looks pretty good with your blue walls too! Wow…amazing. The hard work on the front end definitely made for a striking finished quilt. Being the auntie to these girls, I have some insight into their love of their parents. This quilt is both profound and beautiful, just as the 3 girls are. It so depicts the closeness of the Myer clan and I think you have done an exceptional job of the product itself, but the story of the progress is the icing on the cake. What a treasure to put it on your bed, or frame or bolster, but to have the instructions as they became reality is so precious. Thank you from one of the Myers, and I can’t wait to see it for real! Lovely work. What a fantastic finish! This will be treasured for years to come! Whoa! Totally different from all of the heavily distorted photos you gave over the months! Very clever and very good! This turned out really amazing though and I am a sucker for lots of color! Such a great memorabilia!